Welcome to Step 2 of integrating your Microsoft Office 365 account with ProSpace. After you created a generic Booking Account, it is time to create a ProSpace Account. If you do not have a generic Booking Account kindly go back to Step 1. 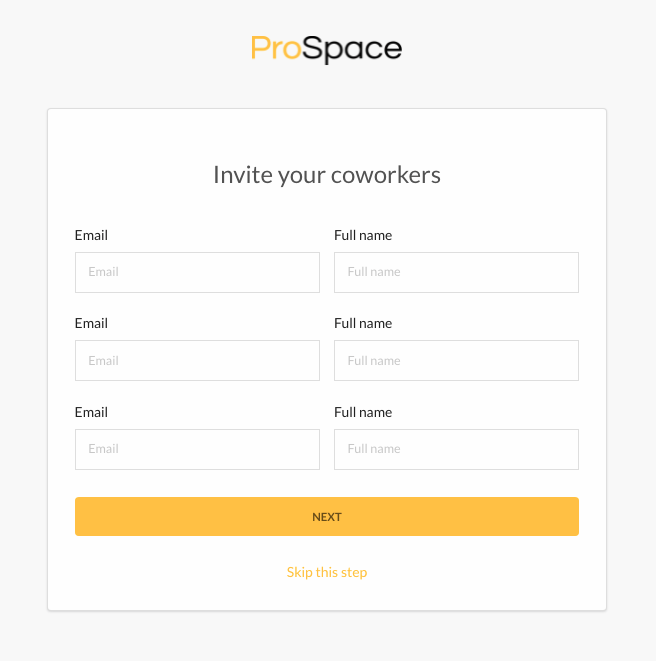 Set-up an Account with ProSpace. To start, go to ProSpace registration page. You will be navigated to the account like the screenshot below. Fill in the details and click “Register”. Once you click “Register”, you will receive an email from ProSpace. Follow the instruction and you will be asked to log in with your email address and password. Upon logging in, follow the on boarding process to set your account at ProSpace. We will start by adding an office like the picture bellow. Name your office and filled in the address accordingly. The address of the building will determine the timezone of the building. Once you click next, you will be ask to add floors where your meeting rooms are located. If your meeting rooms are located in different floors, you can add them simultaneously by separating them with commas. Spaces in ProSpace represent your actual meeting room, we suggest that you name these Spaces according to the actual meeting room at your office. This will make it easier for you to manage it, and for other to book the correct rooms. Afterwards, you will be asked to integrate with a calendar. Select the ‘Microsoft Office 365’, This is where the generic Booking Account you created in Step 1 will be use. For calendar integration, Microsoft requires an account that can grant permission for ProSpace to access your organization calendar and user information. This can be given via Global Admin account. Next, a pop up will appear with a list of accounts you have in O365. Select or add the Booking Account you created in Step 1 / M2. Lastly, invite your co-worker to join the organization. Congratulation! You have set up your ProSpace Account.